Missouri’s Parkland, encompassing the counties of St. Francois, Ste. Genevieve, Madson, and Iron includes an available workforce of over 40,000 with diverse and varied skill sets that support world class manufacturers and service industries. 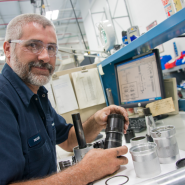 The regional workforce includes employees specialzing in injected and roto-molded plastics, precision machine tool, automotive component and accessories, appliance components and glass. In addition, our workforce supports global inbound call center operations and medical claim processing. The workforce in the region is exceptional with strong work ethics and tremendously varied skill sets. Farmington companies draw talented individuals from a nearly 50 mile radius in the areas of manufacturing, service, technical support, and management. In addition, the quality of life, job opportunities and proximity to beautiful parks and other natural resources makes it an easy, attractive decision for seasoned professionals to relocate and raise a family here. To learn more about employment resources that are available to you click on a logo. St. Francois County has been certified as an ACT Work Ready Community! Other Parkland Counties are well on their way to achieving this national distinction. By participating in the ACT Work Ready Communities [WRC] initiative, counties can identify skill gaps and quantify the skill level of their workforce. This helps educators build career pathways aligned to the needs of business and industry — and it also helps a community stand out and be recognized for its workforce development efforts. A strong workforce is a tremendous economic development advantage. TalentForce is a full service employment agency that offers flexible employment options for both employers and employees. TalentForce, an Employment Staffing Group company, offers short-term projects, temporary, temp-to-hire, long-term staffing and direct hire staffing options. At TalentForce, our product is the “match” of our client’s unique staffing requirement with our associates’ skills, work history, and career goals. Our history of service excellence and relentless dedication to your success, positions us as a proven partner. Whatever your hiring or career goal may include TalentForce will exceed your expectations. Missouri’s workforce system is localized to fourteen specific regions across the Show-Me State. Each of the fourteen areas are served by a local Workforce Development Board that manages the workforce system based on the unique needs of the local economy. The WDBs have a professional staff to oversee important initiatives along with operations of the Missouri Job Centers. The Workforce Development Board local office is located conveniently located at 403 Parkway Drive, Suite A, Park Hills, Missouri 63601, 573.518.2431.